As part of its tour around the region, Embraer’s E190-E2, an efficient single aisle commercial jet, has flown for an hour in the sky of Bangladesh to display the capabilities of the aircraft and landed at Hazrat Shahjalal International Airport in the capital on Thursday morning. Embraer, a Brazilian aerospace conglomerate, made the fly as part of their tour around the region and gave the guest from aviation industry a closer look at the world’s quietest, cleanest and most efficient new-generation single-aisle jet aircraft. Embraer is the world’s leading manufacturer of commercial jets with up to 150 seats. 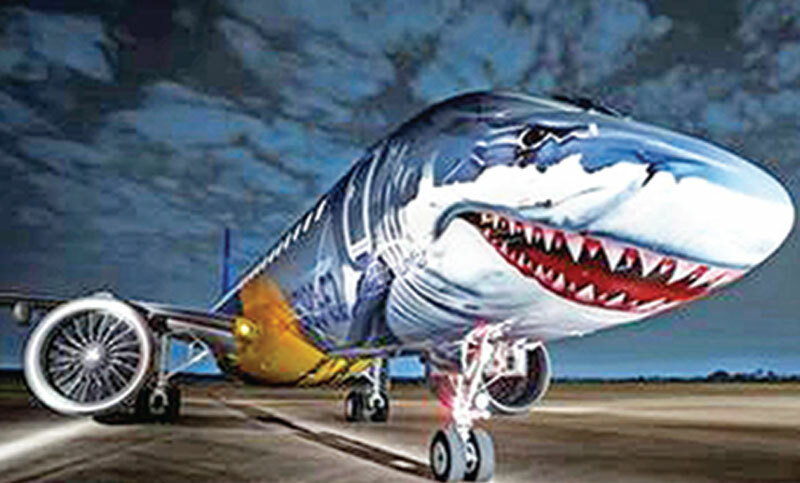 Charge d’Affaires of Brazil Embassy in Dhaka, Embraer Asia Pacific Vice-President Cesar Pereira, top officials of Bangladeshi private airlines, CAAB and Biman officials were also on the board of the display fly of the new shark-faced aircraft. “We are proud to bring this aircraft to the region for the second time to show the amazing capabilities of the E190-E2,” Embraer Asia Pacific Vice President Cesar Pereira said. New Delhi, India for flying around one hour and 37 minutes, according to the flight chart. The E190-E2 offers airlines of lower operating costs and is capable of achieving similar costs per seat of larger re-engined narrow body aircraft, with significantly lower costs per trip, said Pereira adding that this particular aircraft have also received a lot of positive feedback about the aircraft performance, low fuel consumption, sleek and modern interior and low cabin noise. Delivered to its launch customer in April last year, and now operated by two airlines Norway’s Wide roe and Kazakhstan’s Air Astana, the E190-E2 has gained a reputation in the industry for having met all its milestones ahead of schedule, and with final specifications better than the originally expected, said the Vice President. Mentioning Bangladesh as a potential market, Cesar Pereira said E-Jets E2’s value proposition in the Asia Pacific region is its ability to enable airlines to sustainably develop more routes secondary or tertiary cities. Embraer forecasts a demand for 10,550 new aircraft with up to 150 seats worldwide, worth $600 billion, over the next 20 years, more than 3,000 of which will origin from the Asia Pacific region, including China. The Company has 100 customers from all over the world operating the ERJ and the E-Jet families of aircraft. For the E-Jets program alone, Embraer has logged more than 1,800 orders and 1,400 deliveries, redefining the raditional concept of regional aircraft by operating across a range of business applications. The E-Jets E2 is the most efficient family of aircraft in the single-aisle market burning up to 10 percent less fuel than its direct competitor. The E190-E2 brings also more flexibility with maximum range of up to 5,300 km or about 1,000 km longer than the first-generation E190. In terms of pilot transition, pilots of the first-generation E-Jets will need only 2.5 days of training and no full flight simulator to fly an E2.